The process of making cold smoked salmon requires patience, knowledge and specialized equipment. Preparing and smoking this delicacy takes time, but properly done it's worth the wait. "So what exactly is involved in cold smoking salmon, and how long does it take?" That two-pronged question came by way of the Smoker Cooking contact form. The reader received a gift of smoked salmon, and she liked it so much that she had to have more. When she went out to buy more, she found that it doesn't come cheap, and decided that making it herself might be possible. So kick back, take your shoes off, and sit a spell while we dive into the world of cold smoked salmon! When cooking salmon in a cold smoker, it should never reach a temperature above eighty degrees Fahrenheit. Technically, the fish is raw, but cured. A long bath in a highly saturated brine causes the proteins to denature…it modifies the structure of the salmon flesh. And in a sense, that's "cooking it" by way of a chemical process. To make your own cold smoked salmon, you'll first need the right equipment. A standard meat smoker usually runs just too darn hot to cold smoke. If you have a wood burning pit smoker or a charcoal smoker, it'll have to sit this one out. If you have a little time and a little money, can build your own cold smoke generator using inexpensive items and your gas or charcoal grill. Choose your cold smoker wisely. Many "fish smokers" run too hot for making cold smoked salmon, though they are great for hot smoking salmon. The Smokehouse Products Big Chief and Little Chief smokers operate at around 160F, and they're not adjustable…that's way too hot for cold smoking salmon. Cookshack smokers will smoke at 100F, but that's still too warm for what we want to do. Smokin' Tex provides an optional cold smoke plate that fits their smoker. I have not used a Smokin' Tex with the cold plate, so I am not able to comment on the effectiveness of that set-up. The best I've found is the Bradley Smoker, which can cold smoke, but tends to run too hot unless steps are taken to keep the temperature lower. Placing ice in the smoking chamber with the salmon is one cure to the problem. Another fix is to separate the smoke generator and smoker chamber with a length of clothes dryer ducting and a large cardboard box. The box acts as a cooling chamber for the smoke. 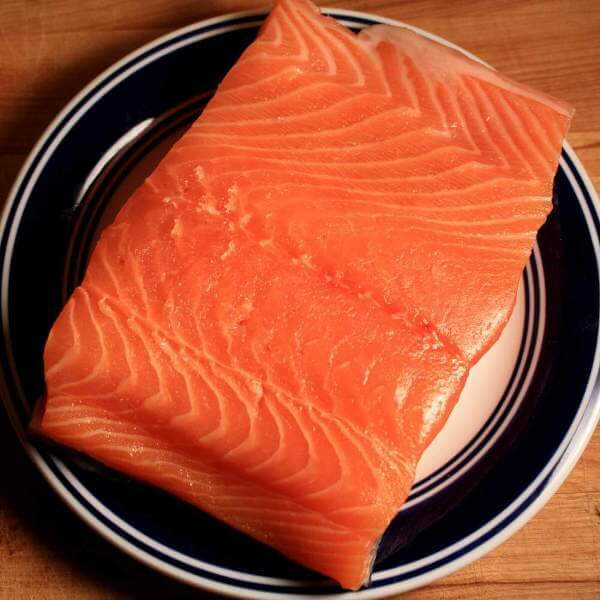 Fresh salmon and previously frozen salmon are not equals when it comes to cold smoking salmon. Freezing actually benefits the cold smoked salmon in a couple of ways. As the salmon freezes, the liquid in the cells expands, causing the cell walls to rupture. When thawed, liquid drains readily from the flesh, meaning there's less water for the brine to remove. Freezing also kill parasites. One week at minus ten degrees Fahrenheit kills parasites that would otherwise survive brining and cold smoking. To be safe, deep-freeze your salmon that has been cold smoked using fresh fish. There are many types of salmon to choose from. King, coho, sockeye, chum and Atlantic are some of the commonly available salmons. You'll find that different species of salmon have different levels of oil (and flavor) in their flesh. There are also tips on how to pick out the freshest salmon for your smoker. Salmon fillets should be scaled and boneless. The fillets may have pin bones running down their length. If they do, a pair of pliers is all it takes to remove them. Here's how to do it. With light pressure, run your fingers along the flesh side of the fillet. If the pin bones are there, you’ll feel the ends, evenly spaced between the head end and the tail end. As you find them, pull them out with the pliers…needle nose pliers work best. The sides can be left whole if there's room in your smoker, or cut into smaller pieces. One and one-half to two inch wide chunks cut from the fillet is a good size. Either way, leave the skin on to hold everything together. Smaller pieces will brine and smoke more quickly, since a greater surface area of each section is exposed. Puncturing the skin or carefully scoring it with a razor blade will ensure more even brining and curing. Don't cut or puncture deeply, but go deep enough to expose the flesh. 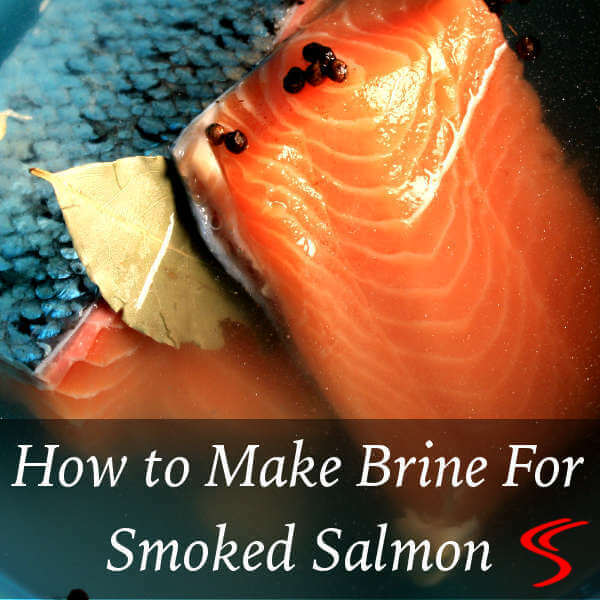 This is a brine recipe that I use to prepare the salmon for cold smoking. Combine all of the ingredients in a large pan and heat to a boil. Simmer for five minutes, cover the pan, and then cool to room temperature. Try to float an egg in the brine. If it doesn't float, mix in another 1/4 cup of salt. Test again with the egg. Again, if it doesn't float, add another 1/4 cup of salt. Repeat until the egg floats. Refrigerate the brine until it is 40 degrees or less before adding the salmon. The brine must be between 35F and 40F. Too cold and it slows the brining reactions, and if too warm it could allow bacteria to grow…over 40F is getting into the danger zone. The salmon now goes into the brine where it remains from 6 to 12 hours. The brining time is variable due to a couple of factors…thickness, and whether it was previously frozen. The thicker the fillets are, the longer they’ll need to brine. If previously frozen, decrease the brining time. Now the excess salt needs to be rinsed from the salmon. 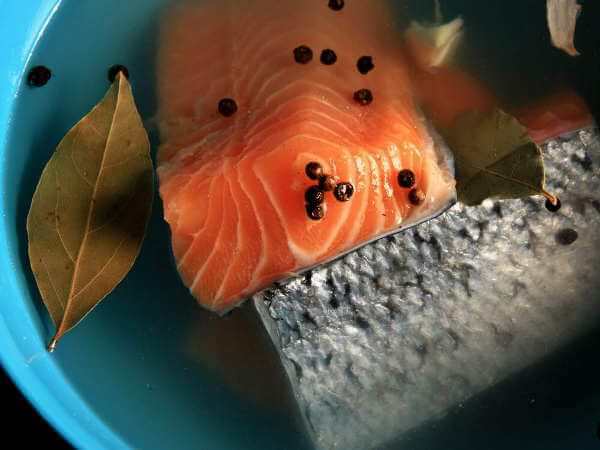 Remove the salmon into a clean container, or reuse the rinsed out brining container. The salmon needs to be rinsed for one-half hour to remove the excess salt. Allow water to run constantly into the container throughout the half-hour. Gently agitate the salmon every few minutes during the rinse, and be gentle with the salmon, since it can break up easily at this stage. Now the fun part…it's time to taste test for saltiness. Go ahead! Try a piece of it raw! But if you don't want to, don't fret. Slice off a piece and gently cook it in the microwave before you taste. If it's still too salty, rinse it for another ten to fifteen minutes, but no more, or it will begin to absorb water. The salmon must now be allowed to cure. Place the fish on a rack and let it rest in the fridge, uncovered, for 12 hours. 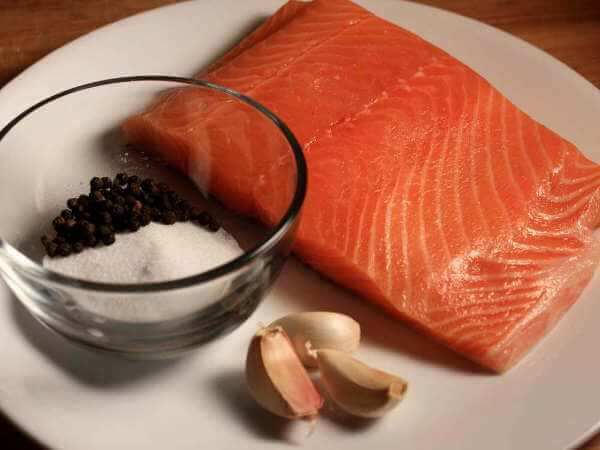 At this time, you can also add spices or herbs to the salmon for flavor and appearance. As the salmon cures, the remaining salt in the flesh evenly redistributes, preventing you from having salty-centered salmon. The proteins start to bind together, and the salmon dehydrates a bit, too, which both need to happen before it hits the smoker. This is also when the pellicle forms. The pellicle is a dry, thin layer of proteins that were liquefied during brining. When it's formed, you'll see a semi-glossy, clear coating on the fish. The pellicle prevents large amounts of liquid from oozing out of the salmon as it smokes, which would create whitish curds on the surface…unattractive, but harmless. So are you ready? Let's smoke! Make sure there's plenty of space around each piece of salmon for air and smoke to circulate. Leave space around the outer edges of the rack, too. Put the rack in the smoker, and start it up. When using the Bradley smoker, make sure to unplug the heating element and use only the smoke generator. The salmon will be done in twelve to sixteen hours. The salmon will slightly dry while smoking, and become a bit firmer to the touch. Continue smoking if you'd like a more intense smoky flavor. If you don't have a vacuum food sealer, by all means find one. Vacuum storage is the ideal way to pack cold smoked salmon. After sealing your smoked salmon, refrigerate it for short term storage, or freeze it to enjoy year around. Making cold smoked salmon at home requires specialized equipment and knowledge. With these, and patience, you can create healthy and delicious cold smoked salmon.